A soulful collection of old favorites and new melodies. Rebecca Schorr's sweet voice will move and delight you. 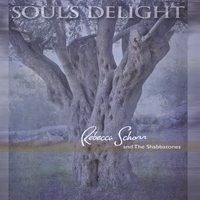 "Soul's Delight" contains selections from a musical Shabbat Service created by Rabbi Rebecca Schorr in 2002 known as "got Shabbat?". A lifelong lover of music, Rebecca has always found music to be the most basic conduit between one's soul and God. This album explores some of her favorite liturgical melodies. Rabbi Schorr's voice is as beautiful as a singing bird. Her range and pitch resonate in my mind and her love for Judaism which is evident in her singing fills my heart with love and joy...what a touching and genuine musical experience. I got this as a gift from my mom. It's great to have on to get in the mood for Shabbat. Relaxing and a little jazzy. I think it would also be good for someone who wants to get a little more familiar with some of the songs in a service because it has some standards like Mi Chamoca and the Shma. I especially like the renditions of Or Zarua and Salaam.